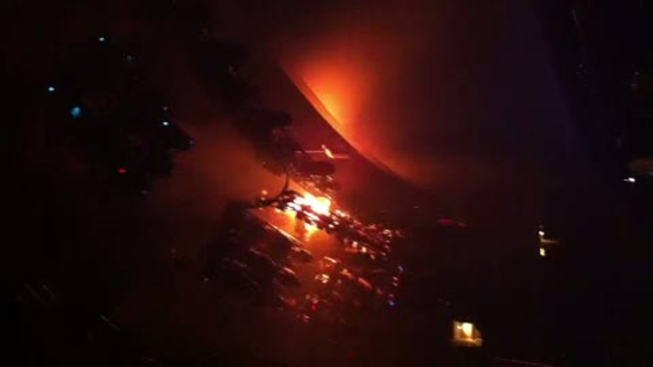 A light caught fire above the stage, ending Rihanna's Dallas show early. R&B star Rihanna's Dallas concert was cut short Friday night by a fire. The show at the American Airlines Center went off without a hitch until a pyrotechnics display high above the singer caught fire, Dallas Fire-Rescue said Saturday. Rihanna, dressed in a floor-length canary-colored gown with a bejeweled black and white neckline, quickly exited at stage left as sparks fell to the floor. Many fans who were lucky enough to score front-row tickets quickly moved toward the exits. Shortly thereafter, smoke started to fill the arena, the lights came on, and sirens began to go off. Fans cheered when the fire was put out, but concert-goers were evacuated from the AAC. Dallas Fire-Rescue said it received calls saying the curtains and part of the stagework caught fire, but the fire was out by the time firefighters arrived. "DALLAS!!! We set the stage on FYAH tonight!!! LITERALLY!!! I'm so pissed, I was havin so much fun wit yall too!!! I gotta come back man!!" Rihanna tweeted after the stadium was evacuated. Later on Twitter, she said she was heading into a meeting to find out what happened. Rihanna also promised on Twitter that she would be back to Dallas. Dallas Fire-Rescue confirmed that no one was injured in the fire and no citations were issued. If you have photos or video, email them to isee@nbcdfw.com.